The global porcine vaccines market is expanding due to growing prevalence of swine diseases across the globe. 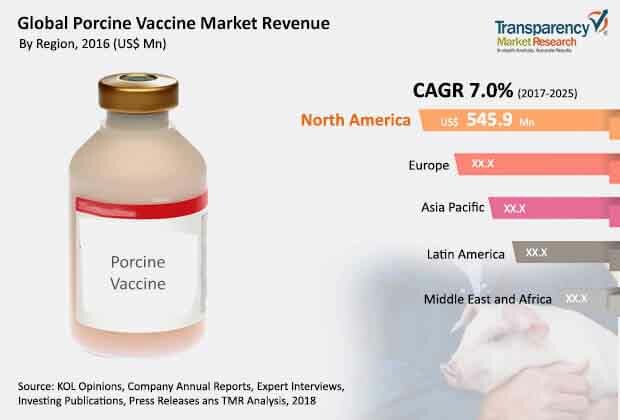 The global porcine vaccines market was valued at US$ 1,784.0 Mn in 2016 and is projected to expand at a compounded annual growth rate (CAGR) of over 7.0% from 2017 to 2025, to reach value of US$ 3,208.8 Mn by 2025. The global market is witnessing growth at a relatively high rate, owing to rise in investments by governments in the field of animal health care, high incidence of swine fever, increase in R&D expenses incurred for eradicating porcine health issues, and surge in the demand for porcine meat and gelatin. Porcine vaccine is an administrative as well as clinical drug that helps in improving health of swine and protects them from deadly viruses, bacteria, and pathogens. Diseases such as diarrhea, swine influenza, porcine reproductive and respiratory syndrome, and porcine circovirus associated disease (PCVAD) have been greatly reduced from spreading in an endemic manner. A few diseases such as foot & mouth disease and cholera high fever have been eliminated in swine in North America and Europe through vaccination. The success of animal vaccination remains as an ideal interval for booster vaccination. A porcine vaccine aids the swine or hogs suffering from epidemic porcine diseases. It also improves overall efficiency in protecting pigs from deadly viruses and increases the production level of high-quality meat for consumption. High prevalence and incidence rates of porcine epidemic diarrhea (PED), swine flu, and porcine reproductive and respiratory syndrome (PRRS) in swine production farms worldwide have resulted in increase in early vaccination of piglets and adult pigs. There has been increase in the number of awareness programs about porcine diseases and rise in the number of joint venture programs by key players in different regions for research and development of swine vaccines. These factors are collectively projected to drive the demand for porcine vaccines across the world in the near future. Also, technological advancements such as combined vaccine production and DNA vaccines enable agriculture farmers to produce disease-free pigs. This factor is estimated to fuel the porcine vaccines market in the near future. The global porcine vaccines market has been broadly segmented based on technology, disease indication, end-user, and region. In terms of technology, the global market has been categorized into inactivated vaccines, live attenuated vaccines, toxoid vaccines, recombinant vaccines, conjugate vaccines, and DNA vaccines. The inactivated vaccines segment accounted for a key share (in terms of revenue) of the global market in 2016. The live attenuated vaccines segment is estimated to expand at a significant growth rate during the forecast period and is estimated to gain a significant market share by 2025. DNA vaccines also offer several advantages over live attenuated vaccines and inactivated vaccines and thus, DNA vaccines are increasingly gaining popularity among veterinary hospitals and hog production farms. In terms of disease indication, the global porcine vaccines market has been divided into diarrhea, swine influenza, arthritis, Bordetella rhinitis, porcine reproductive and respiratory syndrome (PRRS), porcine circovirus associated disease (PCVAD), and others (CHRS, leptospirosis, etc.). Diarrhea and swine influenza segments dominated the global market in 2016 and are likely to continue their dominance from 2017 to 2025, with a marginal increase in their market shares by 2025. Increasing production of pigs in farms for meat, gelatin, and other products; changes in climate including global warming; overfeeding of protein diet; and increasing occurrence of genetically modified strains of influenza viruses have led to significant shares held by diarrhea and swine influenza segments in the global market. In terms of end-user, the global market has been divided into veterinary hospitals and hog production farms. The hog production farms segment is estimated to gain a significant market share by 2025, due to increasing demand for production of pigs for meat and other products. Geographically, the global porcine vaccines market has been segregated into North America, Europe, Asia Pacific, Latin America, and Middle East & Africa. North America dominated the global market in 2016 and is projected to lose market share by 2025. The market in North America is primarily driven by rapid increase in pig cultivation and rise in infection of pigs caused by viruses such as PEDV, PCV, and PRRSV in the U.S. Moreover, rise in contract farming and independent farming for pig production has been observed in the U.S., which is projected to fuel the hog production farms segment of the market in the U.S. during the forecast period. Asia Pacific is projected to be a rapidly expanding market for porcine vaccines during the forecast period. China dominates the porcine vaccines market in Asia Pacific. The market in Rest of Asia Pacific (including Vietnam, the Philippines, etc.) is estimated to expand at a significant CAGR during the forecast period. Companies such as Boehringer Ingelheim GmbH, Ceva Santé Animale, Elanco (Eli Lilly and Company), Merck & Co., Inc., and Zoetis, Inc. were major players in the global porcine vaccines market in 2016. Zoetis, Inc. dominated the market with its diversified product portfolio, extensive geographical presence, and acquisition strategies. In 2015, the company invested over US$ 1.0 Bn in two largest acquisitions. One of them was the acquisition of PHARMAQ, which strengthened Zoetis’ core livestock business division. Other players operating in the global market include Bimeda Animal Health, Vetoquinol, and Bayer AG. Companies are adopting the strategy of acquisitions and collaborations to enhance and strengthen their geographical presence.